If the option to go back was delivered to my doorstep, there is no doubt that the retreating journey would be quite interesting with today’s wisdom and knowledge in hand. Packing up all I’ve gleaned at God’s feet would make my twenties a very different place to live. There were moments along the way where I lived paralyzed. By fear. With indecision. In seeking approval from other people. The ill pursuit of perfection, planted my feet rather than pushing me forward. While I’d like to think that my lack of movement was my form of waiting for God’s direction, truthfully it wasn’t waiting—it was stalling. The motion of time has taught me this: God meets us in our movement. While there are often times in our lives when we have to be still and wait, there are also moments of seeming silence when God is simply asking us to move. 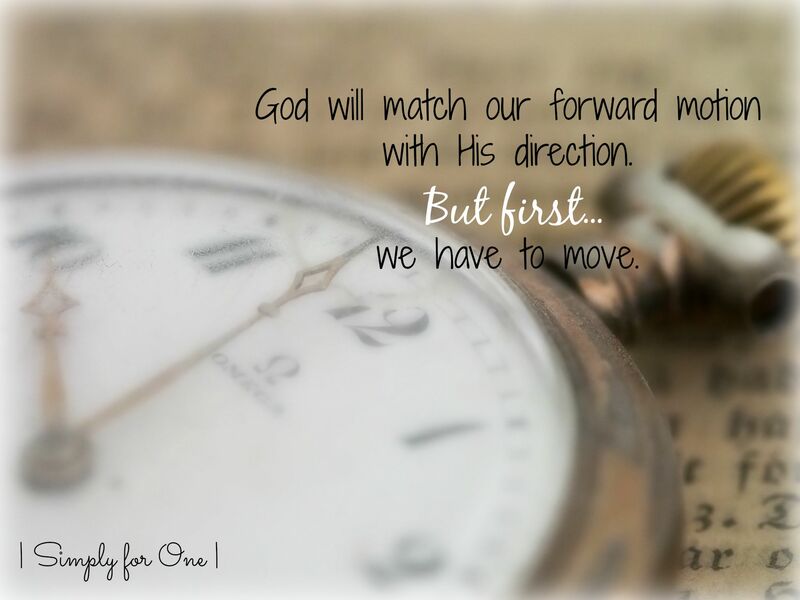 God will match our forward motion with His direction. But first we have to move. It can be so hard, can’t it? We worry over what’s up ahead. We wonder whether the path we travel truly merits our steps. We long for some sign to tell us that it’s safe to press on. Truth be told, we crave answers that fall from the sky. But they don’t often come that way, do they? You can also find these words linked up at my favorite spots: Holly Barrett (#testimonytuesday), Kelly Balarie (#raralinkup), Holley Gerth (#coffeeforyourheart), Kristin Hill Taylor (#threewordwednesday), Bonnie Gray (#faithbarista), and Jennifer Dukes Lee (#tellhisstory). That hit me right in the soul, Tiffany. Gah… your words come at a time when I’ve been waffling over a couple of things. Meanwhile, I know He’s been waiting for me to step out. That’s how I felt when God first got me too. Stepping out isn’t easy, but we have a safety net, right? I’m grateful for a God who leads and guides when we are faithful to pursue Him. Thanks for being here, friend. Hugs! EWWW! This one hits home as I have wished for senior wisdom back when I was even in my 30s and early 40s, let alone my 20s. God is still teaching me but with what I have gained, I still want to know what tomorrow will bring. I love your words about moving. It is in that step-by-step when we learn trust. I still need God’s hand and always will. That’s a good thing! Great post, I’m headed over to read the rest! And happy birthday a few weeks early! What a milestone! Love your series Tiffany. Jeanne, when is your birthday? I’ve got one coming up too! God does know where we need to go and leads us there, but so often we veer off the path, don’t we? Enjoy your birthday! When I turned 40 I enjoyed by bday by running away, leaving town to visit my brother who I knew wouldn’t make a big deal out of my turning 40. It was a milestone I wasn’t too excited about at the time. Tiffany, this meets me right where I am right now. God’s been walking with me, but He’s asking me to move…and, even though the path can be confusing at times, there’s no other path I’d rather be on. :) Thanks for sharing. Happy, upcoming, birthday! I’m so glad to hear that God met you through the words, Brenda. I know those paths can be a bit uncertain (or a lot), but I’m with you … His path is the only one to take. I pray that He gives you wide and clear spaces and that you sense His nearness as He travels beside you. May we move in His might. Thanks for the birthday wishes too – it’s right around the bend. ;) Blessings, friend. It does seem like God moves when I am about the business of obeying all that He has given me to do. Thanks for such a positive post today. Found you on RaRa. Thank YOU for being here Melanie. I so relate to your words – that when we are about the business of forward motion obedience, God keeps moving before us clearing the path and leading the way. It’s a beautiful thing to know our God is so intimately invested in our comings and going. So glad you stopped by from #RaRalinkup. God meets us in our movement. Loved this!! I’m learning that truth every day. As I’ve moved to accept where He has me now, He is moving in me to stir my heart for what He’s called me to right now. Great post, Tiffany! I love that God moves and stirs in our lives, when we allow Him too. It’s not always easy to accept, especially when it looks so much different than we thought – but His plans are GOOD! So grateful to move with Him. Thanks for being here today, Holly – and for hosting such a lovely link up. Blessings! Hello Jeanne, firstly happy birthday. You have reached a very important milestone in life. Thank you for sharing your experience. There is always a place for work when it comes to our faith. God Bless you Jeanne and Tiffany. Thanks for the birthday wish, Ifeoma. It’s right around the corner! And yes, God does require that we put feet to our faith and not just be hearers of the word, but doers. Thanks for being here!